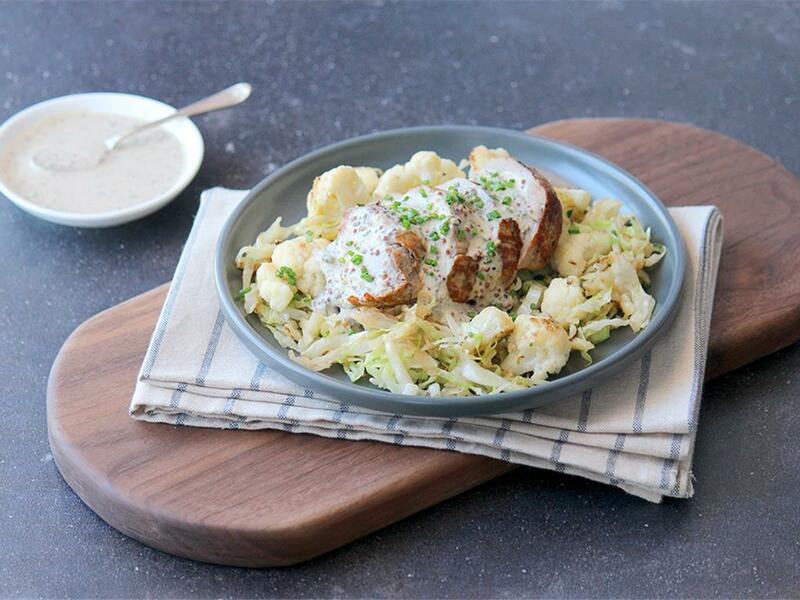 Tender pork fillet topped with mustard chive sauce served with buttery cabbage & cauliflower. Pork fillet: Place a pan in medium-high heat with a drizzle of olive oil. When hot, brown the fillet for 4-5 minutes. Then place in the oven on a tin foil lined baking tray and cook for another 8-10 minutes. Remove and season with salt and pepper. Mustard chive sauce: Remove the pan from the heat and add a little water (½ tbsp) to deglaze. Then stir in the cream, mustard and ¾ of the chives. Set aside. Cabbage & cauliflower: Place a separate pan on high heat with a knob of butter. When the butter has melted, add the cauliflower and sauté for 3 minutes until golden. Turn the heat down to medium-high, then add the cabbage and sauté for 5 minutes. Mix in the REST of the chives, season generously with salt and pepper and stir through a little more butter (optional) before serving. Serve by slicing the fillet and pour over the mustard chive sauce. Serve with the cabbage and cauliflower.